The first warm day of the year – so let’s bring it on: upper 80’s. Too much too soon? In post-race chats some of us were commenting on the tights, gloves and long-sleeved shirts in our laundry baskets – worn a couple days ago. Tonight singlets and shorts were dripping wet when the runners finished the Lake Q 5K. There was consensus among us: It was hot as hell out there and none of us are acclimated. The race was well attended, attracting quite a crowd for such a low-key affair. 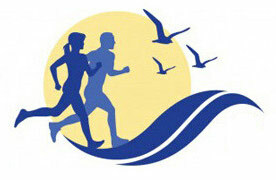 The Mystic Runners were kind enough to invite the North Shore Striders, gratis, to their weekly race series. Fourteen Striders took them up on the offer. The very congenial atmosphere was refreshing. While we were “competing,” there was no cut-throat feeling, no one seemed to really care about their time. Of course this is what we say when we’re all slow, though some of us are oblivious to weather and run fast all the time, like Sal Genovere and Lauren Hamilton who came in under 23 minutes (15 days after completing Boston 2018!) and Kate Page (who also ran a stellar Boston 15 days ago) blazed in just a minute later. The jaunt around the lake was pleasant and on another day it would be a very fast course. The casual atmosphere was enhanced by all the folks who were not involved in this race just running and walking around the lake as well because it’s a nice place to be. A lot of children were being pushed in carriages, people were walking their dogs, everyone was cordial and it just felt like a laid back mid-summer’s night. Nice. After the race, we were treated to fabulous pizza and cookies and pretzels and water and snacks provided by the Mystic Runners. It was enjoyable to just hang around post-race and chit-chat with old friends and new ones and watch the pretty colors of sunset reflect off Lake Q.
Hi Striders. Linda Desjardins here making a correction. I messed up and I promise it won’t be the last time I mess up! I credited Kate Page with running Boston this year but I mentally transposed names and it was Kate GAGE who ran Boston.